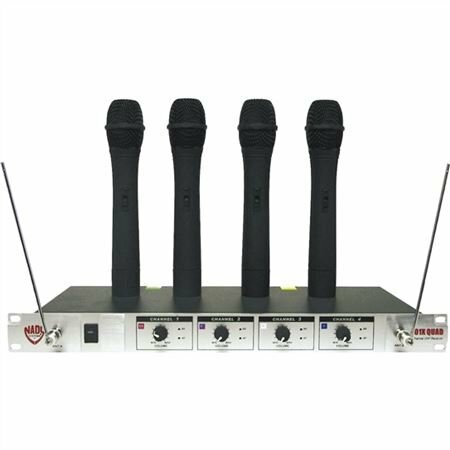 Shop Nady 401X QUAD 4 Channel VHF Handheld Wireless Mic System from AMS with 0% Interest Payment Plans and Free Shipping. If you need multiple wireless handheld mics with great reliability and sound for a great price, look no further! The Nady 401X QUAD handheld wireless mic system provides features found on systems costing much more and are the ideal choice for houses of worship, schools, music venues, karaoke and so much more! Very effecient, manageable and fit into our current system with no issues!!! Great unit when you do shows that require more than one mic. Massive range, I ran each mic to a separate channel on my mixer... worked like a charm! Very nice. It could've come with a carrying case or bag for easy transport.